1) What happens at the Curriculum Fair? For those who don't know...The Curriculum Fair is like a Science or History Fair, except teachers “exhibit” their curriculum oriented toward social justice, we have a keynote speaker and a number of workshops (and food! ), and hundreds of like-minded people gather and learn with each other. 2) What does it mean to "exhibit" curriculum at the Curriculum Fair? Each teacher gets a 6-foot long table at the Fair to set up her/his materials. Many teachers exhibit curriculum by bringing a tri-fold board (like those science fair boards) and bring lesson or unit plans, student work, assignments, artifacts, video, whatever, to share their curriculum ideas. Many bring their students along who sit at the table and explain the work with their teachers. The CF is set up so that we can browse the “exhibits,” talk with each other, and share lessons. 3) Does the curriculum have to be a finished, perfect product to exhibit? Is there such a thing? The whole point of the CF is to recognize that teachers collectively produce knowledge about, for example, how to teach for SJ, and that we have much to learn from each other. There are no blueprints here, and we can learn from our mutual experiences. We strongly encourage teachers to share work “in progress” and to give and get feedback from others in order to further develop our collective understanding of what teaching for SJ means in theory and practice. Sometimes people may feel that their work is somehow not yet “there,” and our view is that the CF is as good a place as any to strengthen it. It has been our shared experience that both exhibitors and non-exhibiting attendees have learned much from participating in the fair. 4) What are the workshops? Although the main focus of the CF is person-to-person contact through the exhibitors at their tables, we also have a limited number of one-hour workshops. These range from curricular innovations about SJ pedagogy to, for example, using multicultural children's literature. These provide more in-depth, interactive ways for teachers and students to present what they’ve been learning and doing in their classrooms. 5) What's the difference between a "curriculum exhibit" and a "resource table?" Exhibitors are usually teachers who have taught a lesson, unit, or project. Resource tables are usually for organizations that produce curriculum and resources for teachers. We do place resource tables and exhibitor tables in the same area, but we really do want to have as many teachers as possible as exhibitors. 6) Who makes all this happen? You do. Probably 60-80 people volunteer, one way or another, to make the CF a reality (we are a totally volunteer organization). And we'd also like to add that Rethinking Schools is a cosponsor of the CF and this is a great chance to meet some of the RS folks and talk with them. They will have all their materials for sale. 1.) You will have table space to display student work, lesson plans, photos, etc. 2.) You should plan for someone to be sitting at your table interacting with visitors for the entire curriculum fair. Please note that "presentations" need only to include: 1.) A brief written description of your idea(s), and/or the actual assignment that you used, if possible. 2.) 1-2 paragraphs reflecting on the process you and students went through to make the idea(s) a reality, e.g., a loose lesson plan. Work in progress is also valued (we suggest bringing 100-150 copies of your plan). 3.) Any examples of student work such as writing, videos, artwork, poetry, projects are more than welcome! If you are interested in presenting, fill out the Presenter Form and email it to tsjpresenters(at)gmail.com. There are a limited number of workshop sessions available during the curriculum fair. Workshops are 50 minute sessions and are available to teachers who wish to present a more detailed overview or discussion of their curriculum. They are not available to curriculum or textbook sales companies. If you are interested in leading a workshop, fill out the Workshop Registration Form and email it to tsjworkshops(at)gmail.com. Last year was my first year exhibiting, and like many, I was very apprehensive at first. However, with the encouragement of my dear friend, Jonah, active member of TSJ, I worked up the courage. Still a little worried about how I could possibly contribute to the fair, I enlisted the help of my co-teacher Mary. We brainstormed how we could or already had incorporated social justice ideals such as anti-racist, multilingual, student-centered, etc. education in the classroom. 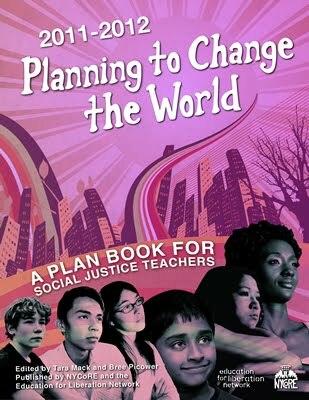 We realized we were implementing social justice principles while teaching the novel, Monster by Walter Dean Myers through our discussions of the injustices youth of color, specifically African Americans, face with the judicial system. We looked at the TSJ exhibitor application, which mentioned that most exhibitors put up science-fair-like boards to exhibit their work. The board didn't take that long to put together, but to ground it in the TSJ principles, I am going to have my students put the board together this year. The next step was to make copies of the worksheets we distributed to students. Also, we put student responses on our boards to help their voices be heard. We were finally ready and excited to exhibit at the fair. The day of the fair we arrived around 9 a.m. and put up our board and copies, which took a whole 5 minutes. During the fair we were at our exhibit, but we weren't chained down to the exhibit, so we were able to enjoy the curriculum fair as well. I hope you end up exhibiting because although you may think you have nothing to offer, the very fact that you are reading this shows your heart is in the right place and have things to share!